This is a list of spreads. A spread is a food that is literally spread, generally with a knife, onto food items such as bread and crackers. 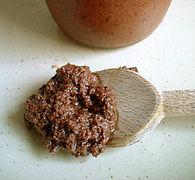 Spreads are added to food to enhance the flavor or texture of the food, which may be considered bland without it. 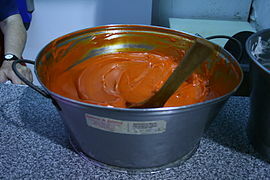 Spread food products are prepared in a paste, syrup, or liquid style, often from ground foods such as fruits and nuts. Butter and butter products are commonly used as a spread on various foods, such as bread, toast, and crackers. 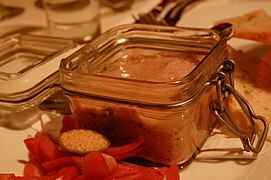 Chatni: a sauce in the cuisines of the Indian subcontinent that can include such forms as tomato relish, a ground peanut garnish or a yogurt, cucumber and mint dip. ^ "Like any fatty spread, Manteca Colorá is best served with some grilled bread and pickles or alongside a nice, acidic salad." ^ Walsh, R. (2013). The Hot Sauce Cookbook: Turn Up the Heat with 60+ Pepper Sauce Recipes. Potter/TenSpeed/Harmony. p. 120. ISBN 978-1-60774-427-6. Retrieved June 23, 2017. 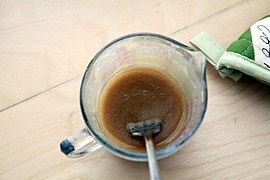 ^ Food Processor Perfection: 75 Amazing Ways to Use the Most Powerful Tool in Your Kitchen. America's Test Kitchen. America's Test Kitchen. 2017. p. 33. ISBN 978-1-940352-90-9. Retrieved June 23, 2017. ^ "Simple and Creamy White Bean Dip with Lemon Zest". Mother Nature Network. October 16, 2014. Retrieved June 23, 2017. ^ Ottolenghi, Yotam (July 2, 2016). 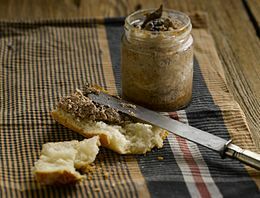 "Slam dunk: Yotam Ottolenghi's recipes for dips, pastes and spreads". The Guardian. Retrieved June 23, 2017. ^ Chubb, Christabel (August 14, 2015). "Would you try spreadable beer?". Telegraph.co.uk. Retrieved June 23, 2017. ^ Riedl, K. (1943). A Guide to Wartime Cooking:. p. 30. Retrieved June 23, 2017. ^ Ranken, M.D. ; Baker, C.G.J. ; Kill, R.C. (1997). Food Industries Manual. Springer. p. 402. ISBN 978-0-7514-0404-3. Retrieved June 23, 2017. ^ Siegel, H. (2015). Totally Bagel Cookbook. Potter/TenSpeed/Harmony. p. 45. ISBN 978-1-60774-903-5. Retrieved June 23, 2017. ^ McGee, H. (2007). On Food and Cooking: The Science and Lore of the Kitchen. Scribner. p. 30. ISBN 978-1-4165-5637-4. Retrieved June 23, 2017. ^ Lukins, S. (2012). Sheila Lukins All Around the World Cookbook. Workman Publishing Company. p. 62. ISBN 978-0-7611-7201-7. ^ International Cooking Library. International Cooking Library. International Publishing Company. 1913. p. 26. Retrieved June 23, 2017. ^ Druggists' Circular. Druggists Circular. 1937. p. 71. Retrieved June 23, 2017. ^ "Honey! What's making a buzz?". Trinuneindia News Service. May 27, 2017. Retrieved June 23, 2017. ^ Levy, F. (2003). Feast from the Mideast: 250 Sun-Drenched Dishes from the Lands of the Bible. HarperCollins. p. 34. ISBN 978-0-06-009361-7. Retrieved June 23, 2017. ^ a b The World's Best Spicy Food: Where to Find it & How to Make it. Lonely Planet Publications. 2014. p. 194. ISBN 978-1-74360-421-2. Retrieved June 23, 2017. ^ Weiss, J.; Andrés, J.; Rawlinson, N.; Mora, S. (2014). Charcutería: The Soul of Spain. Agate Publishing. p. 362. ISBN 978-1-57284-737-8. Retrieved June 23, 2017. ^ Lambert, A. (1899). Guide for Nut Cookery: Together with a Brief History of Nuts and Their Food Values. J. Lambert & Company. p. 396. Retrieved June 23, 2017. ^ Ardekani, A. S. H.; Shahedi, M.; Kabir, G. (2009). 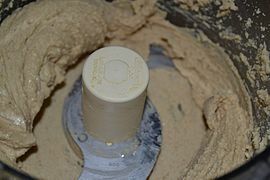 "Optimizing Formulation of Pistachio Butter Production" (PDF). Journal of Science and Technology of Agriculture and Natural Resources. 13 (47): 49–59. Archived from the original (PDF) on 2011-08-19. ^ "SLO County farmers got creative to survive this drought. Are they ready for the next one?". The Tribune. May 8, 2017. Retrieved June 22, 2017. ^ Meyer, A.L. ; Vann, J.M. (2008). The Appetizer Atlas: A World of Small Bites. Houghton Mifflin Harcourt. p. 535. ISBN 978-0-544-17738-3. Retrieved June 23, 2017. ^ Mallows, L.; Abraham, R. (2012). Transylvania. Bradt Guides (in Polish). Bradt Travel Guides. p. 89. ISBN 978-1-84162-419-8. Retrieved June 23, 2017. ^ New York Magazine. New York Media. October 1990. p. 75. Retrieved June 23, 2017. ^ Hastings, C.; De Leo, J.; Wright, C.A. (2014). The Cheesemonger's Seasons: Recipes for Enjoying Cheeses with Ripe Fruits and Vegetables. Chronicle Books LLC. p. 80. ISBN 978-1-4521-3554-0. Retrieved June 23, 2017. ^ Goldstein, D.; Mintz, S. (2015). The Oxford Companion to Sugar and Sweets. Oxford University Press. p. 520. ISBN 978-0-19-931362-4. Retrieved June 23, 2017. ^ a b Better Homes and Gardens Complete Canning Guide: Freezing, Preserving, Drying. Better Homes and Gardens Cooking Series. Houghton Mifflin Harcourt. 2015. p. 51. ISBN 978-0-544-45433-0. Retrieved June 23, 2017. ^ Vegetables Please: The More Vegetables, Less Meat Cookbook. DK Publishing. 2013. p. 302. ISBN 978-1-4654-1627-8. Retrieved June 23, 2017. ^ Lahey, J.; Flaste, R. (2009). My Bread: The Revolutionary No-Work, No-Knead Method. W. W. Norton. p. 176. ISBN 978-0-393-06630-2. Retrieved June 23, 2017. ^ Barrow, C. (2014). Mrs. Wheelbarrow's Practical Pantry: Recipes and Techniques for Year-Round Preserving. W. W. Norton. p. 55. ISBN 978-0-393-24586-8. Retrieved June 23, 2017. ^ Bulletin. Bulletin. Florida Department of Agriculture. 1934. p. 27. Retrieved June 23, 2017. Krampner, Jon (2013). 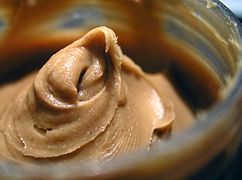 Creamy and Crunchy: An Informal History of Peanut Butter, the All-American Food. Columbia University Press. 320 pages.